How many Africans are there in Guangzhou? This is the first question that came up to my mind when I first realised that there was a sizable population of black Africans in Guangzhou, in late 2008. This is also the question that several academics and dozens of journalists have asked me: ‘how many?’, it seems that everybody wants to know the figure. In order to provide an ‘accurate’ answer, let me do some explaining first. As I have pointed out time and again, truth is that no body really knows how many Africans are there in the city. That figure is impossible to know! And this is due to several reasons. Just to point out a few: a) the Chinese government does not openly share information about the numbers of foreigners in the country (Yes, in 2011 a national census recorded some 600,000 foreigners living in the country, but I’ll talk about this a bit further down in this post); b) due to the bureaucratic complexities involved in the management of foreigners in China (from the ways of counting the entry and exit of people, through the multiple types of visas, to the several government bodies involved in the control of foreigners), I argue that actually not even the Chinese government (whatever that means) has a conclusive figure on the number of Africans that are currently living in Guangzhou (and in the whole country); c) to try to figure out how many Africans are there in Guangzhou, we have to start pulling out hair by hair – this is, at any time, there are multiple types of individuals with very diverse statuses in the city (i.e. there are the ‘more established ones’, people that have been in Guangzhou for over a decade – most of them still live on 3-6 months to 1 year visas, and very very few of them have managed to obtain long residence permits, renewable every 3 to 5 years; there are the ‘more transient ones’, which I claim are the bulk of the population, that continuously move between Africa and China, and whom usually lodge in hotels and stay for 4 to 6 weeks at a time; and, finally, there are of course the ‘first-time newcomers’ and the ‘overstayers’ – the most gosthly and uncountable of all these types- and the Africans that enter China with Western passports). So, as you can see, if we start pulling hairs apart, the composition of the African population in Guangzhou gets quite messy. How can we define who counts as an ‘African in Guangzhou’? Should someone that is visiting the city for the first time ever and that is only staying for 3 weeks on a business trip be counted as an ‘African in Guangzhou’? Should we only count the ones with valid ‘residence permits’ and forget about the ones that live in China for years juggling a plethora of different tourists, student, business visas? What about the ones that opt (or are forced) to overstay? In 2008, research from Sun Yat Sen University pointed to a figure of around 20,000 Africans in the city based on their access to hotel records, and from some data they gathered from the Entry and Exit authorities. One of the problems with this way of measuring is that people were counted on a person-times basis – this is, if Moustapha from Senegal entered China three times in three months he was counted as three Moustaphas. Do you get it? Also, how reliable are hotel records? If Maria from Angola stayed two weeks in Guangzhou, then travelled back to Luanda, and then back again to Guangzhou, during the time of the measurement, she was then counted as two Marias. A great amount of media reports failed to notice this and started reproducing those inaccurate figures indiscriminately without checking or challenging them. Thus, the notion of the 20,000 Africans in Guangzhou (living in hotels), and their growth of about 30-40 percent every year (based on hotel customer occupation) were disseminated throughout media and readopted from time to time by academia. Needless to say, these figures left out all those Africans that do not lodge into hotels: the ones that are married to Chinese, the ones that rent appartments, the ones that arrive at friends’ houses, and so on. In his 2012 book on Africans in China, Adams Bodomo, a linguist back then based in Hong Kong University, suggested that based on his own personal calculations from what he saw in the streets of Guangzhou the figure of Africans in the city would definitively be around the 100 thousand mark (he also suggested the possibility of some 500 thousand Africans living in the whole country). Needless to say, Bodomo’s measuring tool (from what he calculated in the streets) is less rigorous than Sun Yat Sen university’s hotel based measurement. Given the fact that almost everyone is left unhappy when I explain how the complexities involved in trying to ascertain the ‘real’ figure of Africans in the city render the task almost impossible, let’s do some fact-based imaginative speculation (I know it sounds like an oxymoron, but keep reading): as I mentioned earlier, in 2011, the first national census to ever register the number of foreigners legally ‘residing’ in the country reported a solid 600 thousand foreigners in the PRC. Wow, maybe Bodomo’s numbers are right! Maybe there are 500 thousand Africans in China. I’m afraid not. The census was also very clear in specifying that some 70 percent* of these foreigners living in China were nationals of Korea, United States, Japan, Myanmar, Vietnam, Canada, France, India, Germany and Australia. This leaves us with some 180 thousand people living in China that could come from Africa, the Middle East, Latin America, Russia and many other Asian countries. Let’s call this group ‘rest of the world’ (accounting for 30 percent of the foreigners in the census). The census also reported that half of the national foreign population resides in Guangdong province – to which Guangzhou is the capital. So, let’s assume that some 300 thousand foreigners live in Guangdong (mainly in cities like Shenzhen, Guangzhou, Dongguang, Foshan, Zhuhai, Zhongshan, etc). It is not news that many foreigners live in this province, but as Guangzhou is the main city, let’s assume that at least half of the province’s foreign population would live there: 150 thousand foreigners possibly residing in the city. Now, if we extrapolate the nation-wide percentage of foreigners and apply it to Guangzhou (remember that the ‘rest of the world’ group accounts for 30% of the total of the foreign population in the country): there would be some 45 thousand people from the ‘rest of the world’ group residing in Guangzhou – I don’t think I need to remind you that this is all fact-based imaginative speculation. Now that we have reached the 45k figure, it must be noted that Guangzhou’s foreign ethnoscapes are multifarious, complex, and highly dynamic (the city is a Mecca for people on the transnational and translocal moves). From big communities of Arabic speakers, Turks, and other Middle Easterners, to Russians, all kinds of Europeans, and Americans, to Latin Americans and Africans, the city continues to be the historic point of convergence of people from all around the world that it had been for centuries previous to the 40 years of hardline maoist dynasty. However, within Guangzhou’s foreign ethnoscapes, without a doubt, Middle Easterners and Africans are the most visible groups (the major minorities). So, let’s assume that both of these ‘groups’ take up to 50 percent of the ‘rest of the world’ population figure: then we will be left with some 22 thousand individuals of which maybe some 10 thousand could be of Sub-Saharan origin. Finally, this fact-based imaginative speculation exercise has left us with some less than 15 thousand Africans possibly legally residing in the city (full time-ish). However, this speculation does not really satisfy me. I personally believe that the figure of foreigners in Guangzhou could be well beyond what I’m suggesting here, especially if you consider all of those who (like I did a few years ago in Beijing) live there with non-legal resident statuses. If you have reached this point of the post it might be because you’re really interested in knowing how many Africans are there in Guangzhou. How many? How maaaaaany? According to simple mathematical deduction based on the only data available, possibly around 10 thousand ‘legally residing’ – this is 10k people under studies, spouse, or business, visa regimes. Of course, we haven’t spoken about overstayers at all. But before that, lets pay attention to another source of relatively reliable information: community offices (representatives). Yes, African presence in the city has consolidated to such a degree that Africans have started organising themselves into ‘community offices’. According to several sources on the ground, there maybe almost 30 different national offices in Guangzhou. 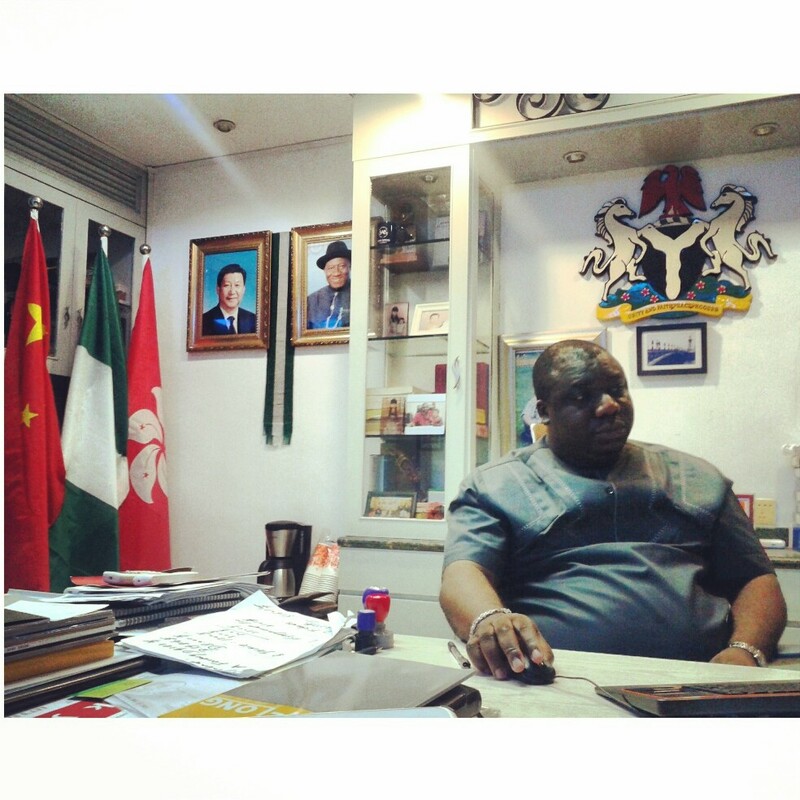 Without a doubt, the most salient is the office of the Nigerian community. Held by middle age long time transnational trader Mr. President Ojukwu Emma, this office claims that there are some 2,500 Nigerians in Guangzhou** – the figure was gathered during the last ‘presidential election’ in which 99,9 percent of the ‘electorate’ voted Emma for another term as President of Nigerians in Guangzhou. During the last Malian national election, journalist Sam Piranty reported that some 650 Malian nationals were registered to vote at the consulate in Guangzhou (although some of these voters could be people on the move not actually residing in the city). Other community offices like Congo, Senegal, or Ghana, have a ‘local’ membership of less than 200 members each. According to different community offices, the above mentioned countries are the ones with the biggest presence in Guangzhou. If we assume that each other community may have at least 100 members (which is not the case, but let’s assume – 20 communities x 100 = 2 thousand), and add up some 3 thousand Nigerians; plus maybe some one thousand Malians; plus some extra one thousand between Congolese, Senegalese and Ghanaians, we’d reach some 7-8 thousand Africans in the city (legally residing). Of course not everyone registers with the community offices. So, you could double, or triple, this number to try to account for those not interested in registering with the communities. However, according to various presidents of community offices, every African that stays for a certain period of time in Guangzhou learns about the advantages of registering with their national office in the city***. So far, both these calculations have led us to believe that, at any given moment, there could be at least some 10 thousand Africans in Guangzhou. This could be an underestimation, however. It all depends on what do we mean by ‘Africans in Guangzhou’. If you want to count all the ones that continuously move back and forth between Africa and China as ‘African population’ of Guangzhou, or if you want to count any single black skin person in Guangzhou at any time, regardless what is their status, as an ‘African in Guangzhou’, then you may reach the 20,000 or maybe 30,000, so widely quoted. Still far away from Bodomo’s 100 thousand Africans in Guangzhou. As you can see, finding the figure is quite difficult. I actually claim that the numbers are not important at all, and that if we focus on transiency (a shared feature of most African sojourns in China) we could learn much more about this exciting case study. But still people, journalists, and academics, always want to know how many. So, let me say that after three years of doing research in Guangzhou, I am seriously doubting that there could be more than 10,000 Africans based in Guangzhou – this is, living there on a permanent basis, either legally or illegally. Of course that at any given moment there can be much more than that if you consider all the ones that are passing through or visiting (on short stays) the city. 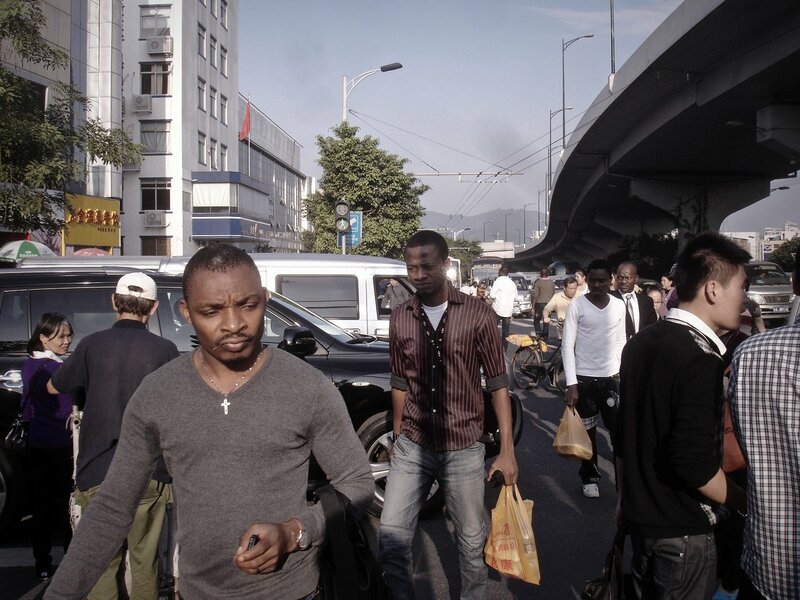 Now, one of my problems with the widely circulated figure of ‘20,000 Africans in Guangzhou’ is that it somehow blurs the patterns and dynamics of overstayers and transients. If it is almost impossible to get an accurate figure of those Africans living in Guangzhou, then to calculate a figure of overstayers (and of those that keep constantly moving in and out) is truly out of our reach. The figures for transients and overstayers vary a lot depending on different national/cultural practices (and also as a consequence of the obstacles/policies the Chinese authorities impose upon foreigners). The majority of Angolans in Guangzhou, for instance, are women on the move that continuously move back and forth in ‘short income boosting’ trips, usually they do not overstay their permits – they come, do their business, leave, and come back. Nigerians, on the other hand, (specially young Nigerians) come to China in ‘suicidal missions’ (success or nothing) and, as is almost impossible to succeed in China in 30 days, many of them opt to overstay. So, while all black people are somehow perceived as the ‘same’ by Chinese – this is, as ‘blacks’ or ‘Africans’- different African nationalities perform differently in China. So, as I have argued elsewhere, to make sense of the stories, joys, and tribulations, of Africans in Guangzhou, it all depends on the approach. If African experience in Guangzhou is seen through the prism of Nigerian perspectives, then we could end up believing that the huge majority of Africans in the city are there under irregular conditions, and always escaping from police. However, if the focus of any analysis is dispersed throughout the vast landscape of the different African communities and practices, the numbers of overstayers decline and a perception of most Africans in Guangzhou being there rightfully slowly emerges. It is complex. Finally, on a side note, one other aspect that has to be accounted for when talking about Africans in the city is that there are many that move back and forth between Guangzhou and Foshan (and other surrounding cities) and that are not usually counted as residing in Guangzhou. Life in Foshan is reportedly less stressful as authorities there are not that focused on harassing black and brown foreigners, like in Guangzhou. Thank for this informative info. Have you read Bodomo’s book?If three years of research gave you this then I am afraid you did not work hard enough. It is clear you want to tear down Bodomo to be famous and your swipe at him is unfounded. His work is based on solid research; your post does not reflect any robust, meticulous effort beyond anecdote, speculation and messy extrapolation. 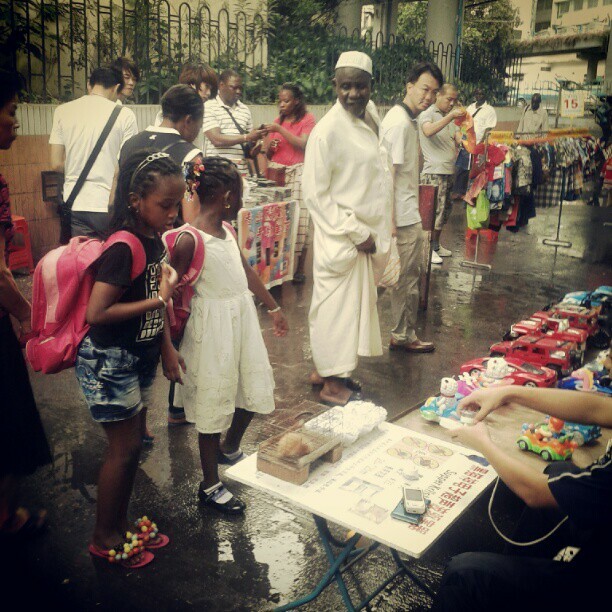 The problem of how many Africans live in Guangzhou is not complicated at all. For any serious researcher one has to define the categories of the population one is interested in and then based on the data make claims. And there are clear categories of Africans living not just in Guangzhou but other provinces in China as well. I do not get the point of your post at all beyond a gleeful need to attack a very distinguished African academic. Lloyd, yes I have read Bodomo’s book and every article he has published on Africans in Guangzhou/China. I agree with you, much of his work is based not only on solid but pioneering and exciting research in Guangzhou. What I was trying to highlight by criticizing his measurements is the difficulty of obtaining data/figures on the numbers of Africans in Guangzhou, I am not at all attempting to tear him down. On another note, I disagree with you, the problem of how many Africans live in Guangzhou is very complicated, not only Bodomo but everyone living and/or doing research in Guangzhou knows that. In terms of the categories of population, if you read the post again you’d find that I did point out to some ‘categories’, however they are not fixed/given. In this case study, it is rather difficult to put people into fixed boxes – that’s one other ‘complexity’ in the data. Finally, please be reminded that this is only a blog post, if you want to know more about the categories of the population in Guangzhou (in their full complexity) stay tuned, as a formal academic article I’m writing will be published here soon. I’m glad that the post came across to you as ‘anecdote, speculation and messy extrapolation’, that’s what it was meant to do/be. Back in 2009 the Nigerian embassy estimated that “there were around 1,000 Nigerians in China, most of them students and academics or business people.” http://www.theguardian.com/world/2009/jul/16/china-african-protesters-immigration-raid But this seems definitely low. 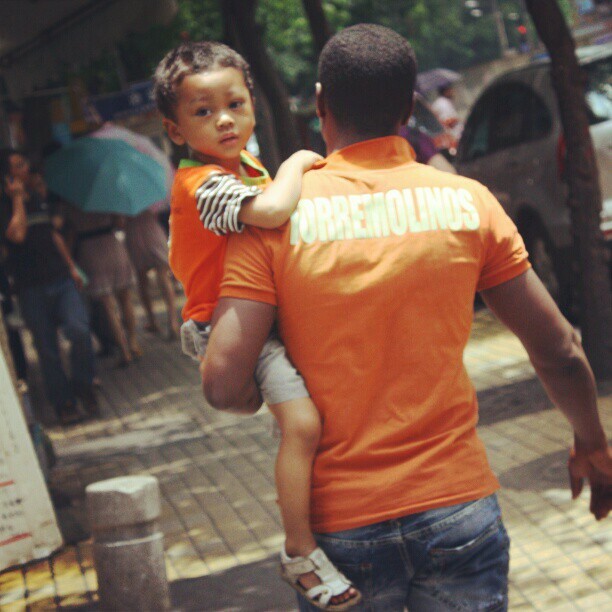 Reblogged this on Africans in China. At this moment on chinese internet, a popular figure is “300,000 African in Guangdong, 90% illegal”, and people are getting scared and emotional. I would like to translate this post into chinese and let people know about the situation as early as possible. But please do tell me if you don’t want, then I’ll delete my translation. Migrant survival in China can be a very difficult thing. This is because, despite its current massive inflows of migrants, the country does not have migrant support systems, is not a full member of the International Organization for Migration, and has not ratified the 1990 International Convention on the Protection of the Rights of All Migrant Workers and Members of their Families. It can be exceptionally difficult for migrants from Africa because of certain explicit disabilities— most of them have anomalous immigration status or lack the expertise and investment capital that could have assisted their adaptation, integration and competitiveness. In default of migrant support systems, African migrants resort to ‘informal’ survival strategies that comprise ‘constrained’ marriage to Chinese, seeking of spiritual solace in Pentecostal Churches most of which operate underground, formation of national and ethnic associations, Chinese language learning, setting up of wholesale and retail sole proprietorships to exploit large African population market, establishment of joint businesses with Chinese, drug trafficking and prostitution.